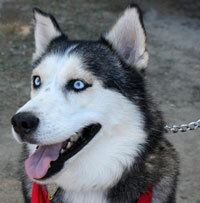 Deacon is a handsome four-year-old black and white male Siberian with a stunning wolf’s coat of shining red highlights. He is a good boy; well mannered and even good on a leash (for a husky). Deacon’s story is sad. He came into rescue after being attacked by another dog. He received a bite to his ear that literally has caused a hole large enough to see through. Still, Deacon remains a happy, well-adjusted pup and he holds no grudges with other dogs. He loves being with people and easily makes new friends on his walks. This boy would love a home where he would have human companions who include him in their daily activities and are home for at least part of the day. He is comfortable in a crate however he is very trustworthy in the house. He’s a curious, happy-go-lucky guy who loves to explore and hang out with his people however would do best in a home without young children. He can be placed with other dogs of similar size however he prefers to be in charge. He would also be content as an only dog. One glance at his infectious smile and gorgeous blue eyes will instantly brighten anyone’s day!